LG recently revealed the highly rumored Optimus 3D Max on Tuesday night, the official successor to the original Optimus 3D. The Optimus 3D Max is thinner than the Optimus 3D and equipped with a dual-core TI OMAP 4430 processor clocked at 1.2GHz, a 4.3-inch 3D display with an ultra tough Corning Gorilla Glass 2 panel, 8GB of internal storage, 1GB of RAM, a 5-megapixel camera capable of snapping 3D photos, a 1,520mAh battery and support for HSPA+ 21Mbps networks. The device runs Android 2.3 (Gingerbread) and also supports HDMI-out, NFC and LG's Tag+ application for interacting with LG's special NFC-activated stickers. The company has also promised an upgrade to Android 4.0 (Ice Cream Sandwich) "shortly after launch." The South Korea-based firm said that it improved the 3D performance on the phone and will now allow users to convert 2D content into 3D content on the fly. Applications such as Google Earth and Google Maps, for example, can be converted into 3D. 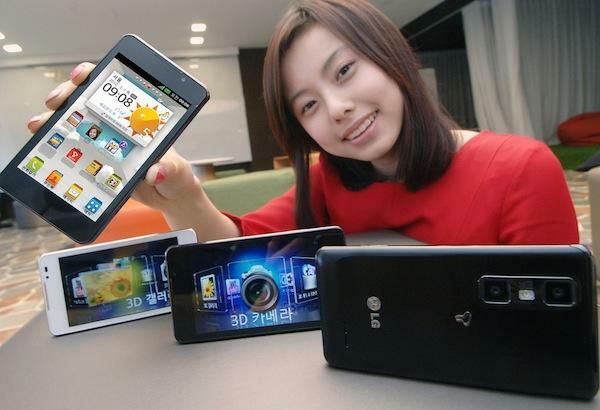 Additionally, LG has included the ability to edit 3D photos and videos on the Optimus 3D Max. LG confirmed that the Optimus 3D Max, also known as the 3D Cube, will launch in South Korea in March and will then gradually launch in other European markets." There's no word on U.S. availability but we wouldn't be surprised to see a successor to AT&T's LG Thrill 4G. We'll definitely bring you a hands-on as soon as possible when we touch down in Barcelona for MWC. ■ True Performance Muscle with Latest Mobile Technologies LG Optimus 3D Max is a powerful smartphone in both 2D and 3D mode and a pleasure to view with LG's exclusive brightened display. 3G's network speed has been also improved to HSPA+ 21Mbps. LG Tag+ offers advanced NFC (Near Field Communication) capabilities designed to promote greater user convenience. One of its benefits is automatic setting changes which are possible by creating predefined tags that are customized to certain modes such as car-mode, office-mode or sleep-mode. Depending on location, the predefined tags will automatically adjust various phone settings including Wi-Fi, bluetooth, GPS and sound volume. – Range Finder to calculate the distance between the camera and the subject as well as the dimensions of an object through triangulation; – Out-focusing Shot to enhance camera quality beyond that of other smartphones through image processing using depth information. ■ True 3D Entertainment Features with Improved 2D-3D Compatibility Users can convert Google Earth, Google Maps and other road views into 3D using the enhanced 3D Converter. Furthermore, 3D photos and videos captured by the Optimus 3D Max can also be viewed in a single-screen mode in 2D, using the 3D Hot Key mounted on the side of the phone to easily toggle between 2D and 3D. LG also plans to continue expanding video contents, applications and games optimized for the 3D Converter available from the 3D Zone at LG SmartWorld. ■ True Excellence in Design with Slimmer and Lighter Body The LG Optimus 3D Max's premium design comes from LG's commitment to fine details. LG focused on trimming details on the design of the Optimus 3D Max by keeping only the essentials and eliminating everything else. Measuring only 9.6 mm thin and weighing 148 grams, the lean body with metallic and rounded edges incorporates the best 3D features in addition to desirable 2D features. The Optimus 3D Max includes unique 3D-style cubicle icons which users can customize with their own photos through the Icon Customizer.